The worst thing you could ever do is go to a restaurant, pay about $20 for crab cakes, bite into them just to see that they’re full of bread. Did you just pay for crab flavored stuffing? No, you didn’t. You’re mad, you’re seething inside. 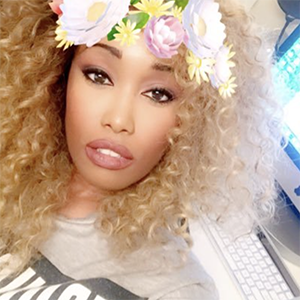 You might even complain to the manager, and you’d be well within your rights to do so. It’s a shame how much bread folks stuff into their crab cakes. 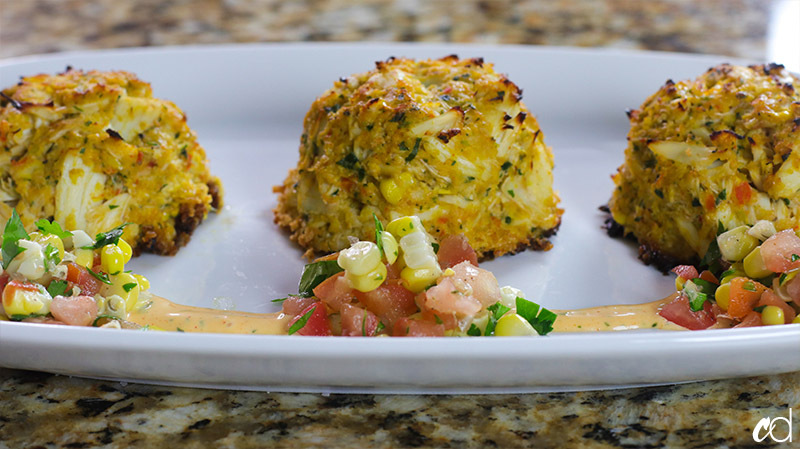 Sure, a little can hold it together, but a lot of restaurants just stuff so much into their crab cakes, the math just doesn’t add up. Jumbo lump crab meat is very expensive, and you deserve better. 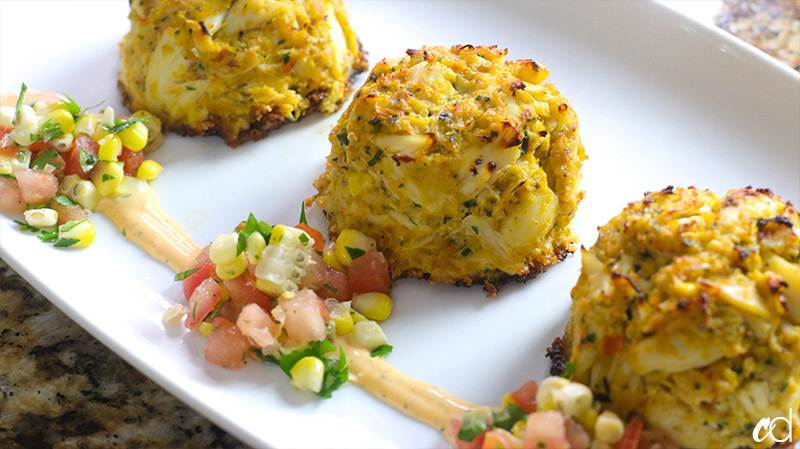 This broiled crab and corn cakes recipe is for those of you who are tired of paying alllll that money for crab cakes, only to get a few chunks of crab and tons of bread’y stuffing. 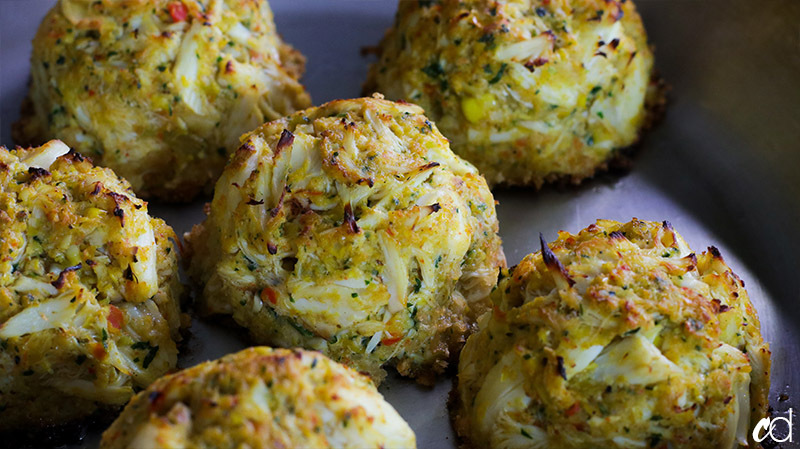 I want to taste crab in my crab cakes, and so do you. Featured in this recipe is fresh corn, shaved right off the cob. If you don’t like corn, you can totally leave it out. 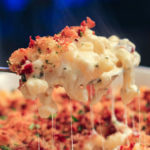 It adds a nice sweetness that compliments the delicate and super expensive crab meat. 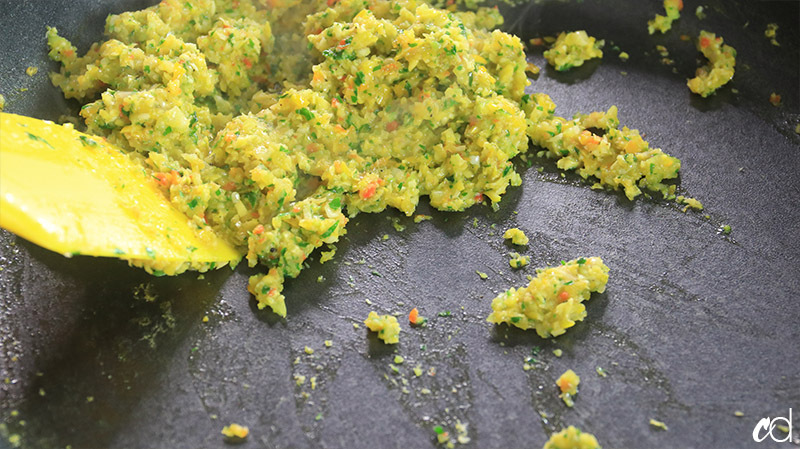 We start off by grinding our veggies down so that we’re not biting into huge chunks, and then sautéing them until they’re tender and lightly caramelized. 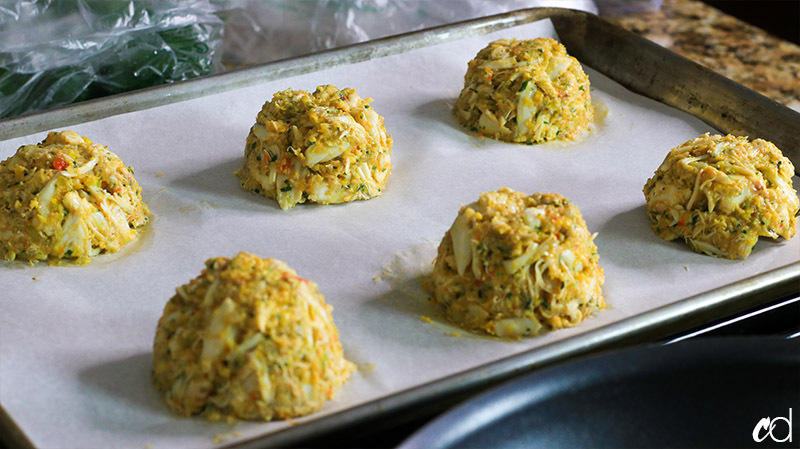 Then, to “glue” the crab cakes together, we are using a method I learned similar to a chicken mousseline. 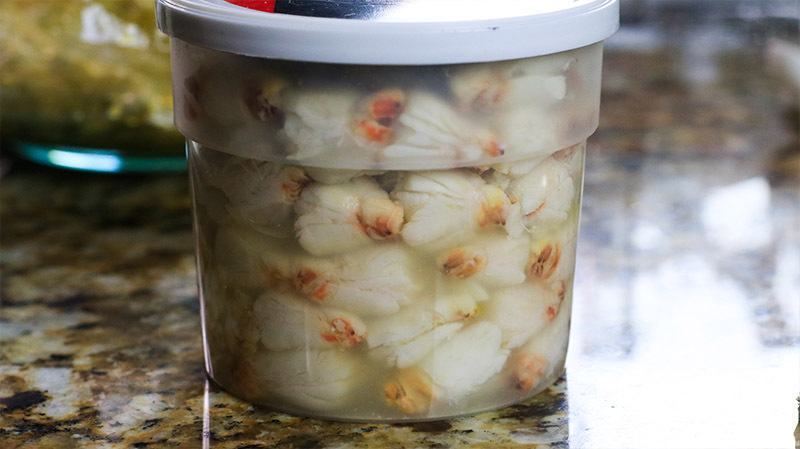 We’re gonna puree some fresh peeled and deveined shrimp (the cheapest kind you can find), with a little heavy cream and make a sticky “glue” to hold the crab cakes together. Shoutout to ATK for discovering that little trick, it’s truly life-changing. 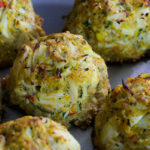 Although I love a good fried crab cake, for this particular recipe I wanted to broil them and keep them from being too greasy. 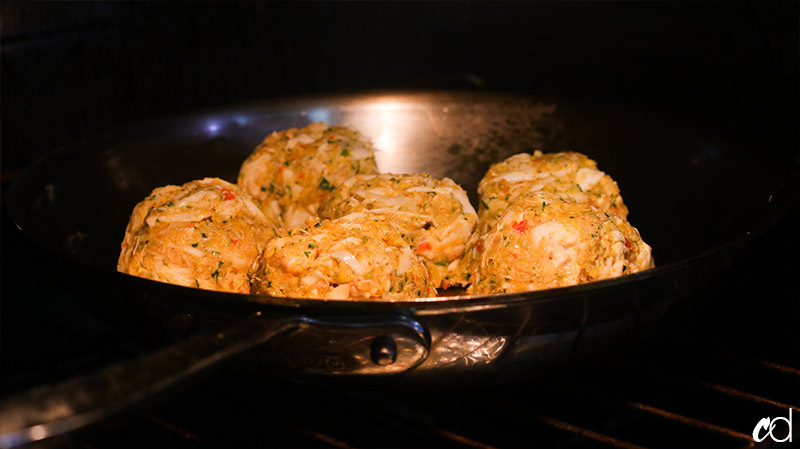 Broiled crab cakes also seem to just allow the sweetness of the crab stand out without competing against a heavy oil. I was in Wegmans, and I walked by one of the most beautiful things I’d ever seen — an Aloha pepper! Have you seen those before? They’re gorgeous! Marbled red and orange, with soft hints of yellow. I was like, “Oh I’m definitely using that for my crab cakes!” If you can’t find Aloha peppers, no sweat. 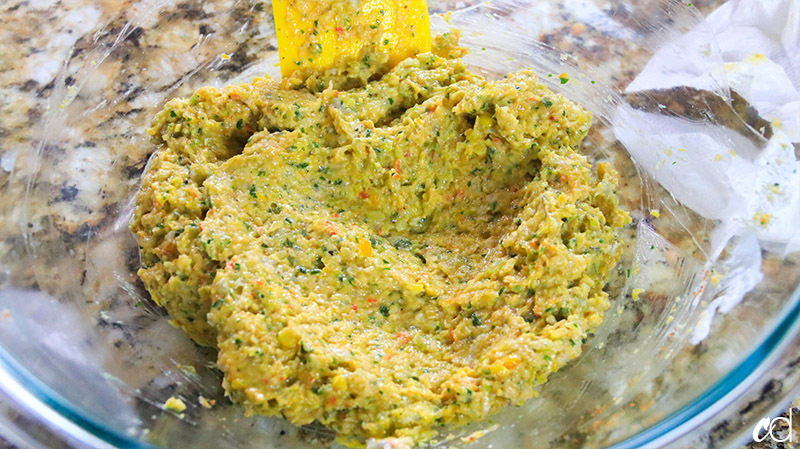 Just use a red, orange, or yellow pepper instead. Green may be too strong a flavor, but if you LOVE green, by all means — do you. 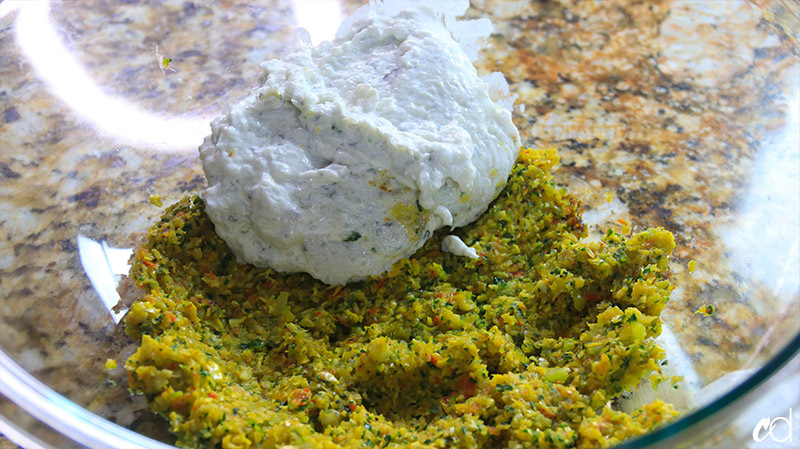 Toss all the veg and herbage into a food processor. Grind it up until it looks like this. You don’t want to puree it, so keep it at this size here. Heat about a tablespoon of oil over medium-high heat, and saute the veg mixture. Add a little salt and pepper. Cook them down until they’re softened and slightly caramelized. You’ll know it’s ready when you can see the pan starting to dry out and a thin sticky coating appears. Toss the mixture into a bowl to cool. Wipe out the pan until it’s dry, and toast some panko bread crumbs until golden brown, like this. Continuously toss them around so they toast evenly. 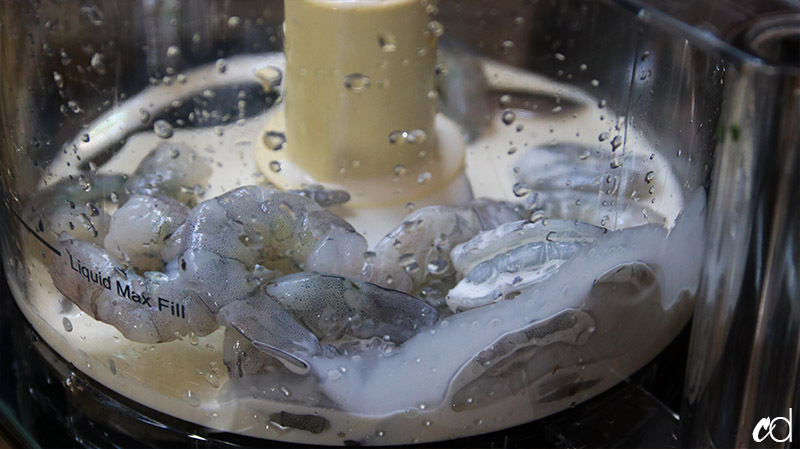 Toss the peeled and deveined shrimp into the food processor, along with the cream. Pulse until finely ground and pasty, like this. Toss the shrimp paste into the veg mixture. Add the worcestershire, cayenne, Old Bay, mustard, lemon juice, salt and pepper. Gently mix all of that around until it’s thoroughly combined. 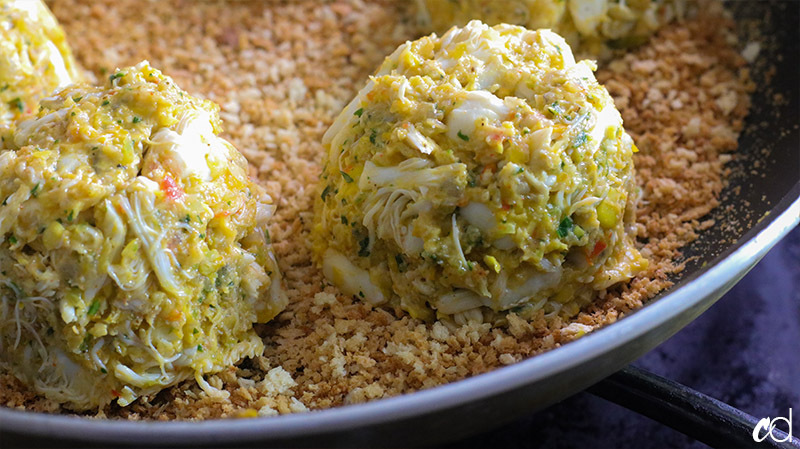 Drain your juicy lump crab meat, and pick thru for any shells. Combine the crab with the shrimpy veg mixture. GENTLY fold the two together. Some lumps will get broken up naturally — and that’s fine, but your goal is to keep as many lumps in tact as you can. 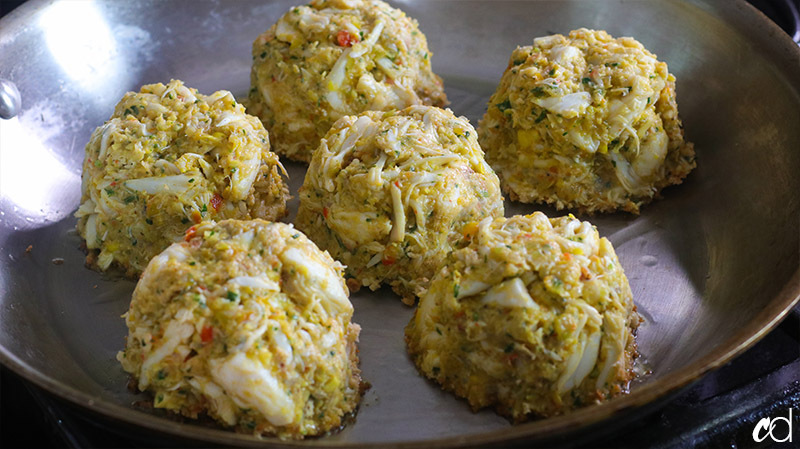 Scoop out desired size balls of crab mixture. I’m using a half-cup measurer here. Just keep in mind if you go smaller, the cooking time will vary. We’ve got six evenly sized cakes. 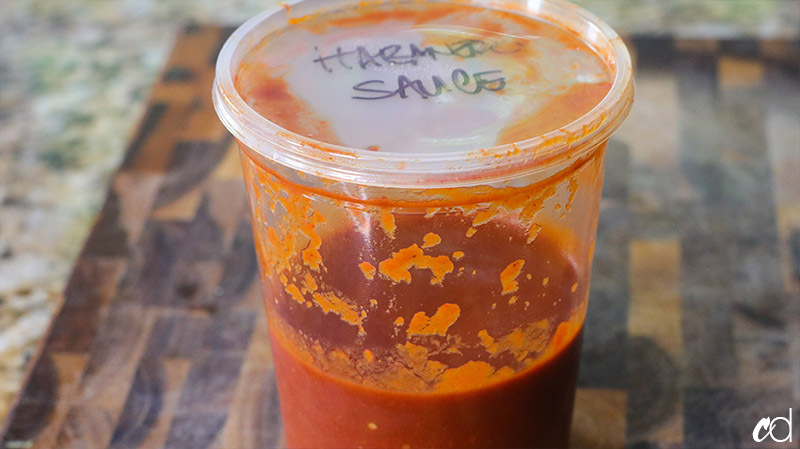 This is an insanely hot and flavorful habanero hot sauce that Kelis made and gave to me from an event we did. I’m using this as a base for my lemony habanero sauce to accompany the crab cakes. You can use any kind of sauce you want for yours. Ok, so pick gently pick the crab cakes up and press the bottoms into the bread crumbs. If you have food gloves, this is easier to do. Like so. 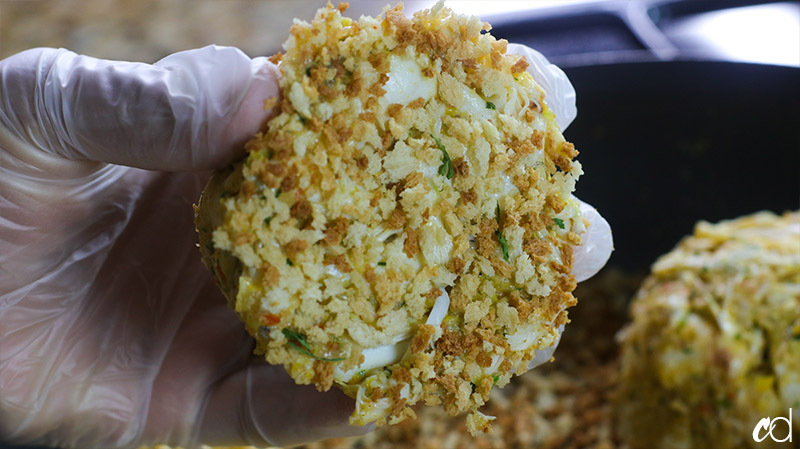 This layer just helps the crab cakes from sticking and provides a nice light crunch element. If this isn’t your thing, you can totally skip it. The main focus here is the crab anyway. Get a frying pan super hot, about medium high heat with a little oil. Place each cake down and let cook for 1 minute, then immediately move the pan into the oven. 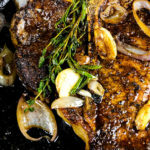 If you don’t have any oven safe cookware (get some, fast), you can just skip this step and put them on a sheet pan and THEN put them in the oven. 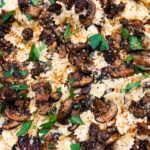 It’s possible you made more veggie and shrimp mixture than you may need. So, start with just a half cup of it to fold into the crab meat. If it’s holding together just enough to form balls, it should be fine. If not, add just a few tablespoons more until it looks like my mixture above, or until it’s holding together. 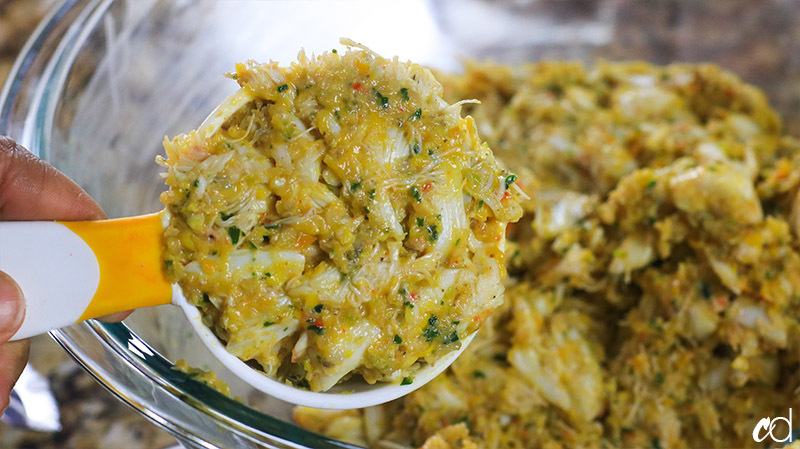 If you have too much veggie and shrimp mixture, and then add your crab meat, you may find that they’re too difficult to work with. Remember, you can always add more, but it’s pretty damn hard to take it away. 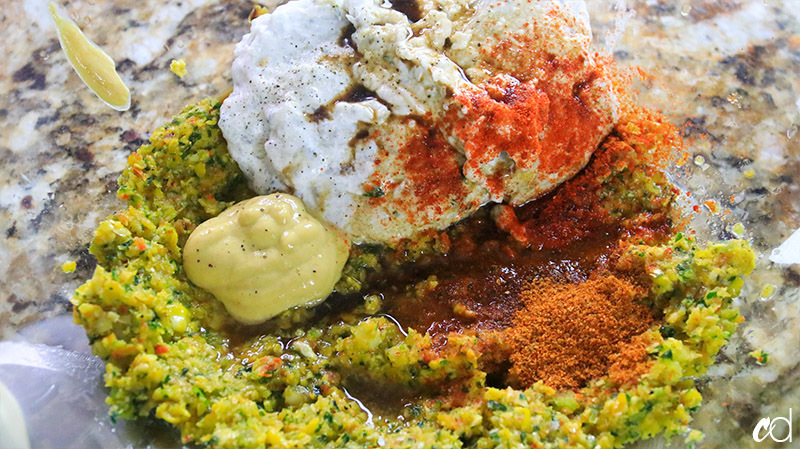 The mixture will be moist, even when you have the perfect ratio of veggie/shrimp to crab. Whatever you do, don’t fry or broil them right away. They WILL fall apart. You must chill them for at least an hour so they keep their integrity. 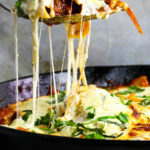 This method is not unique to just this particular recipe. Giving the cakes a quick chill would have to happen even if you made them the more traditional way by stuffing them with a bread’y binder. 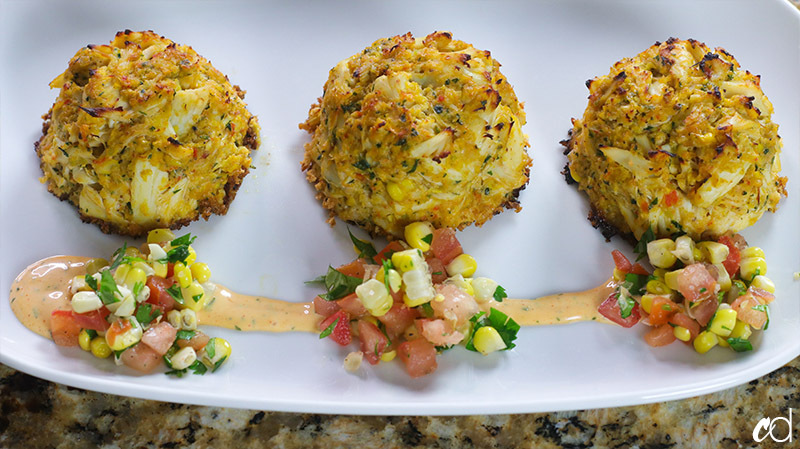 If you prefer to fry your crab cakes, simply flatten the crab cakes into a hockey-puck shape, coat with bread crumbs and fry away. You still want to chill the mixture for a good hour because they will fall apart otherwise. How will you know they’re done? Easily! Visually, wait until the tops of the cakes are golden brown. Take a quick look at mine for example. If you want to make sure they’re done foreal, take your instant-read thermometer and stick it directly in the middle of each cake. When the temperature registers 140 degrees, they’re done. 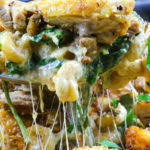 This will take anywhere from 12-15 minutes under the broiler. 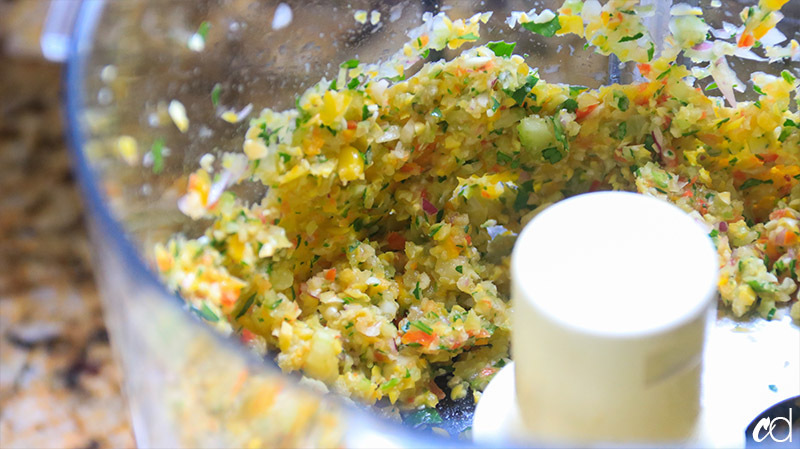 In a food processor, pulse the onion, celery, sweet pepper, corn, garlic, and parsley until finely chopped. Scrape down your bowl as necessary. In a skillet, heat about a tablespoon of olive oil over medium-high heat. 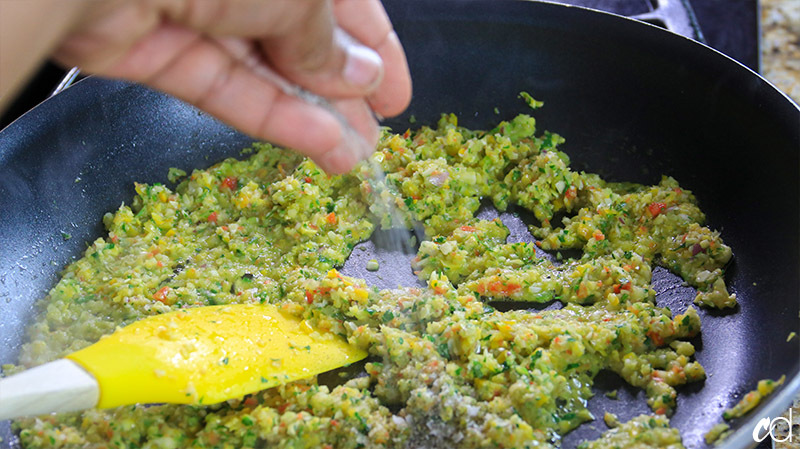 Saute the veggie mixture until softened and lightly caramelized, and the liquid has evaporated. The mixture should be dry and sticking to the pan just slightly. Set aside in a large bowl to cool. Wipe out the skillet, and place a half cup of panko bread crumbs over medium heat. Don’t add any fat to this, just toast the dry bread crumbs until lightly golden brown. 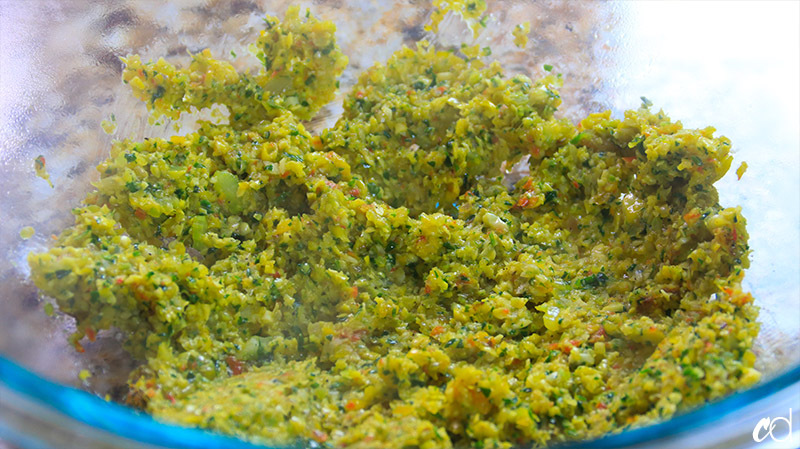 Continuously stir so each crumb gets color. This will take just a few minutes. Alternatively, you can toast these in a preheated 375 degree oven for 2 minutes (keep an eye on them!). 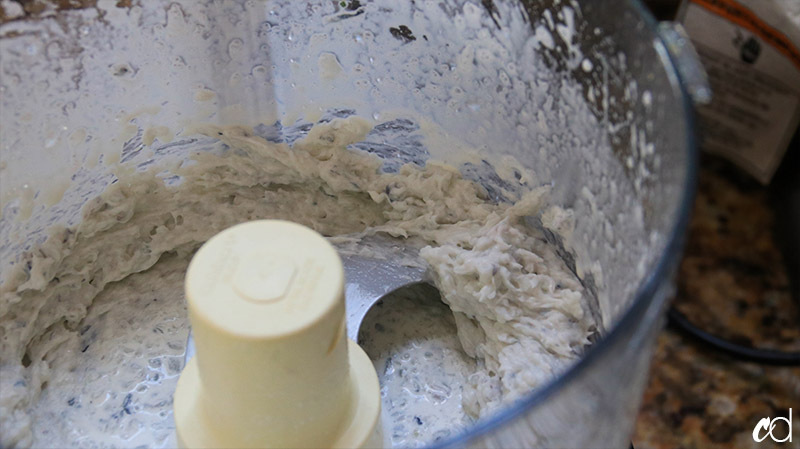 Rinse out the bowl of your food processor, add the shrimp and cream, and pulse until it forms a paste. Scrape it out and add it to the veggies. Add the Worcestershire, dijon mustard, Old Bay, lemon juice, cayenne, salt, and pepper. Fold to thoroughly combine. Drain your crab meat into a colander. Pick thru for any shells, and remove if you find some. 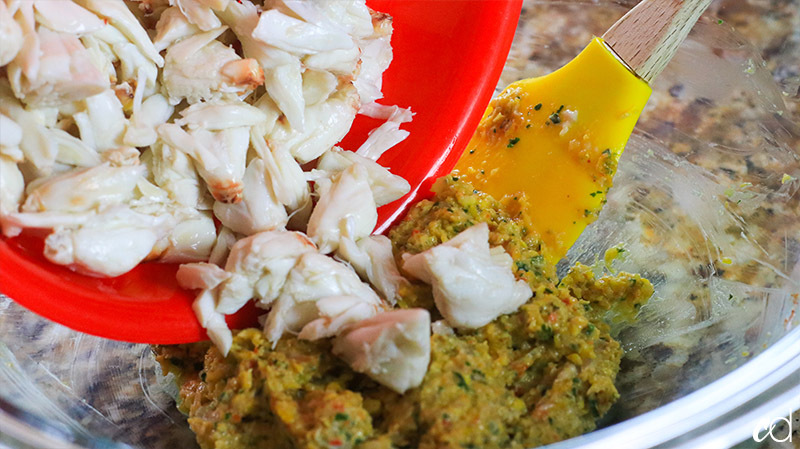 Try not to pulverize your precious crab meat! Add the crab meat to the veggie/shrimp mixture (SEE NOTE BELOW). Gently, and I mean GENTLY fold this mixture together. Yes, some lumps will fall apart, and there’s nothing you can do about that, but TRY not to tear them all apart. It’s a good textural contrast to have some broken lumps against some whole lumps. Just don’t have it looking like canned tuna. Scoop out some cakes. For 6 cakes, use a half cup scoop. For 8 cakes, use a 1/3 cup scoop. You can leave them dome-shaped, or flatten them into a hockey-puck shape if you’d like — there’s no wrong way. 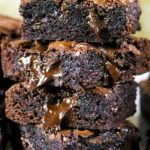 Place each cake onto a sheet pan or large plate, cover with plastic wrap, and place in the fridge for a good hour. After an hour, the cakes should be a little easier to pick up without tearing apart (I used food-grade safety cloves to pick mine up). 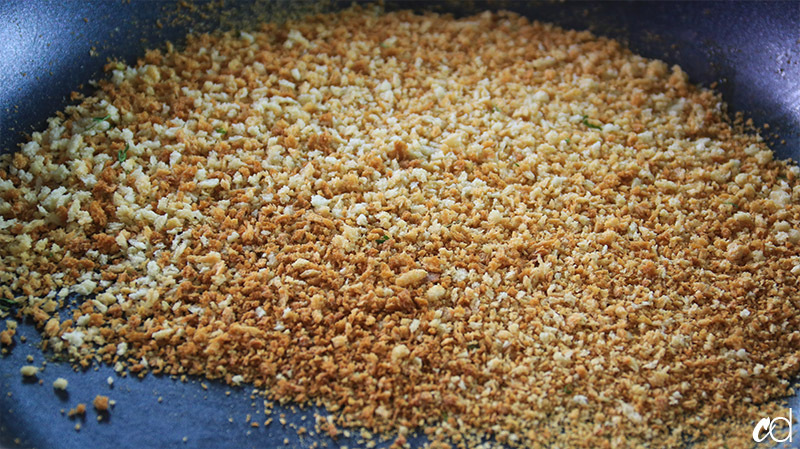 Arrange a layer of the toasted bread crumbs on a plate, and gently press the bottom of each cake into the crumbs. Don’t apply too much pressure here. They will still be moist, and should be able to pick up the crumbs on their own. Just make sure there’s a nice protective layer of crumbs at the bottom of each cake. When all of the cakes are coated at the bottom, heat your skillet to medium-high. Add about a tablespoon or so of oil to the bottom. When the oil starts to shimmer, add the crab cakes. Let them fry at the bottom for just 1 minute, then place the skillet in the oven about 6-8 inches from the top of the pre-heated broiler. Broil the cakes until the centers register 140 degrees and the tops are golden brown, about 12-15 minutes. Serve immediately with lemon wedges, and any other accompaniment you’d like. Enjoy! 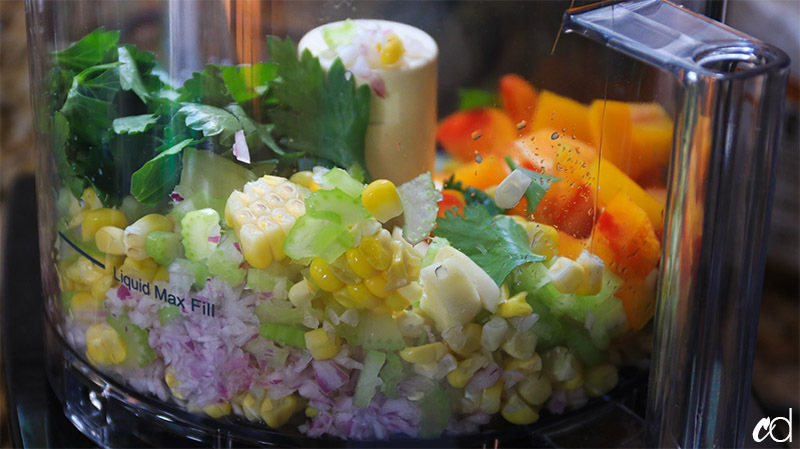 Your veggie/shrimp mixture should only be 1 full cup. 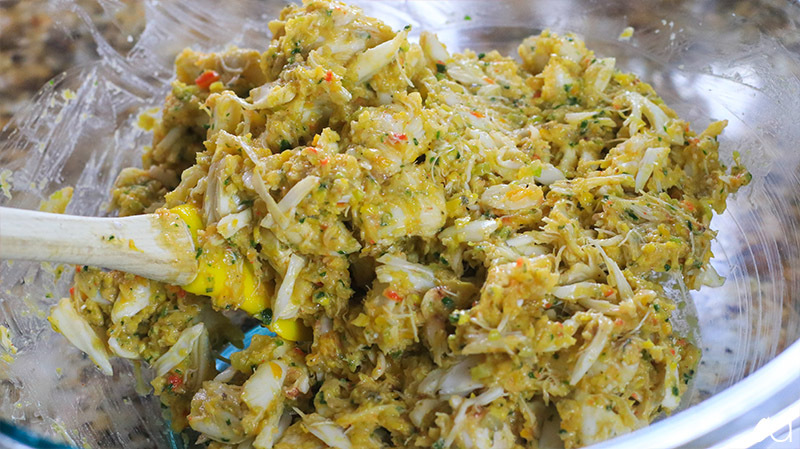 If you have more than that, don’t add it to the crab meat or you’ll find the mixture too wet and difficult to work with. Save it for another use. 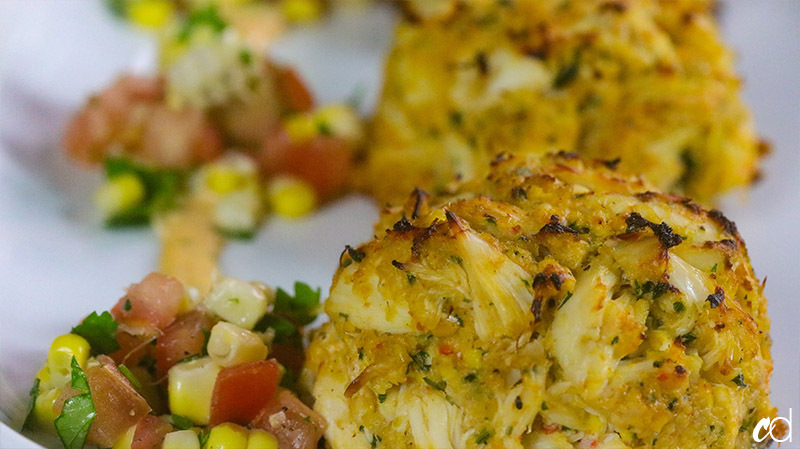 I make these crab cakes all the time with different veggies, and sometimes without the corn. Because this is so focused on the crab, it doesn’t really matter if you leave a veggie out, or swap it with something else. I promise it will all taste amazing, because you made it.